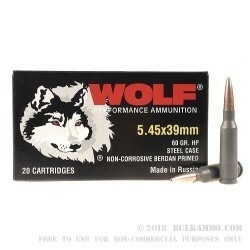 When you're shooting targets that can escape (such as coyotes or rabbits) you'll want to use new production ammo you can count on. 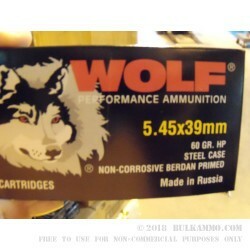 These 5.45x39mm rounds for AK-74 rifles from Wolf are new with non-corrosive Berdan primers and deliver reliable performance for hunting use. 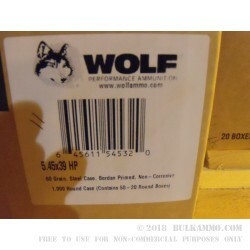 Each cartridge in this bulk priced case of 1,000 (20 boxes of 50 rounds each) fires a 60 grain bimetal jacketed hollow point bullet that offers superior expansion compared to FMJ rounds without being too expensive to use on the range. 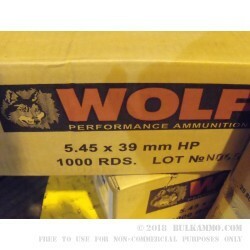 Like most Wolf ammo, these cartridges are loaded in Russia using non-reloadable steel cases with polymer coatings for more reliable feeding and ejection.